In keeping with the apple theme, here is a station activity which uses red cotton puff balls as “apples” to blow to build oral motor skills. 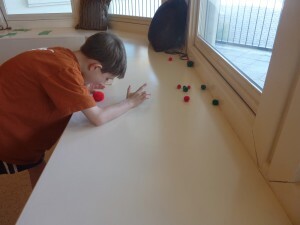 Here is a previous post, Puff Blowing, I did which details why I began using this activity with Andrew. I like to keep Andrew on his toes when working with him so I placed the cotton puffs and some cut up straw pieces into an eyeglass container so when he got to the station, he’d have to open the container (fine motor skills) in order to see what he was going to be doing. You would be surprised at how well the simplest ways of disguising activities works to keep children interested! Here is a link to a post I did a while ago on incorporating mystery and intrigue into My Obstacle Course stations. My Obstacle Course Station Activity: Blow the apples across the counter/into the bushel/off of the table. This activity is really as basic as it seems but because it is part of My Obstacle Course, it became much more purposeful than if I had just randomly said to Andrew, “Blow these puffs off of the counter while Mommy folds the laundry.” Wouldn’t have happened because I tried that. Making it into a station activity, he was willing to blow the puffs which helped build his oral motor skills. Utilizing different size puffs can help build expressive and receptive language by asking the child which size they’d like to start with or asking them to blow a specific sized puff and seeing if they choose the one you described. The same activity could be done with the addition of yellow and green puffs to represent different apple colors (like golden delicious and granny smith). 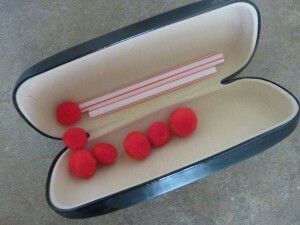 Different lengths of straws and different sized puffs could also be used, requiring different breath power.